There is no place like home, and after a 3-1/2 month absence it seemed like Paradise to settle back into the PAZA rooms at the Casa Callejas in Independencia. Thanks to Laverne Waddington and the orders she drummed up through her weaving workshops in the U.S., the weavers had stayed busy. 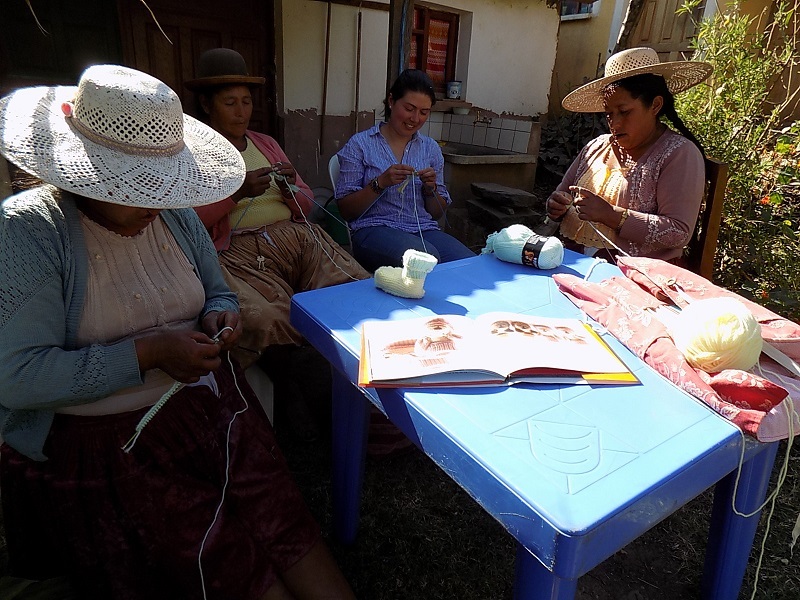 Doña Máxima had carried on the Club de Artesanas (CdA) once a week and had managed the orders, but she was relieved that activities would return to normal at the PAZA workshop. Former volunteer and friend, Alison Walsh, arrived for a 2 week visit in mid-July. She made a sample of a babyt bootie with a rabbit face from a new pattern book in the PAZA library. All the CdA women decided they had a little one for whom they wanted to knit a pair. When Alison wasn´t knitting she was weaving bracelets in bright colors. 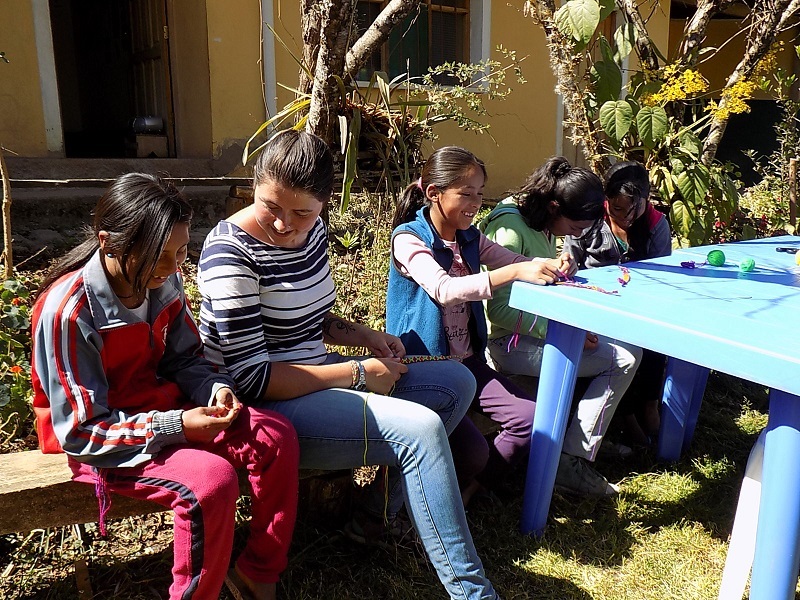 One Saturday morning the CdA chicas admired the array of bracelets adorning Alison´s arms and asked if she would teach them, which she did immediately. Why haven´t the chicas shown any interest in learning the local traditional weaving techniques? Is it because it´s something grandmother used to do, thus old fashioned and not “cool”? It’s time to think about prepping the house gardens for summer’s rainy season. Alison and Doña Máxima were game for an adventure, so a truck was hired to head to Doña Gregoria´s farm to buy “fertilizer”. Sheep are corralled every night, and the manure is raked out and piled high outside the corral, where it is allowed to age. There was no way to contact Doña Gregoria, but she hurriedly appeared in answer to the shouted greetings and her frantically barking dogs. Her alpacas and llamas were disappearing from view having been let loose earlier to graze. It´s dry season so they cover a lot of territory each day to feed. Doña Gregoria doesn´t have much company so she talked animatedly to Doña Maxima while serving her unexpected guests steaming plates of boiled potatoes and boiled corn. Doña Máxima was handed a rope and sent her off in search of a burro to haul the gunny sacks of “fertilizer” up the mountain to the truck. 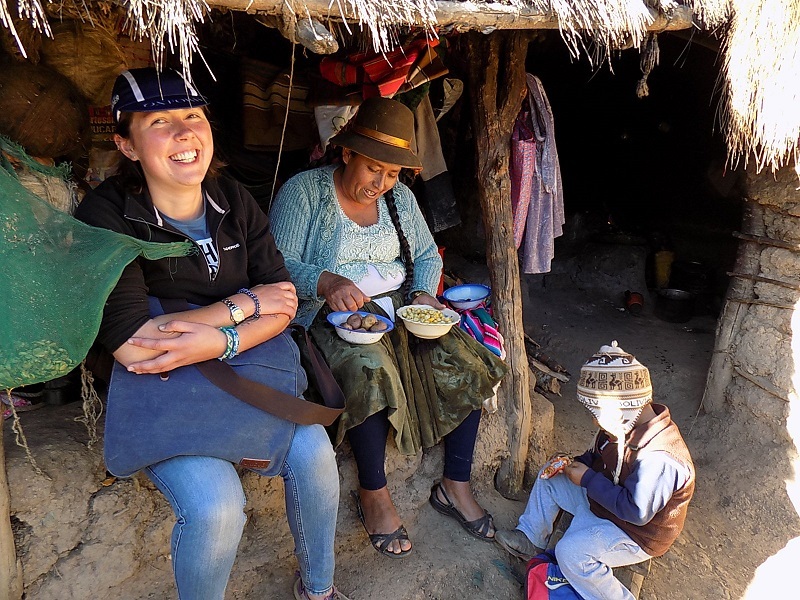 Alison, 5 year old Cristian who is Doña Máxima´s grandson, and Dorinda began filling light-weight plastic gunny sacks they´d brought along. 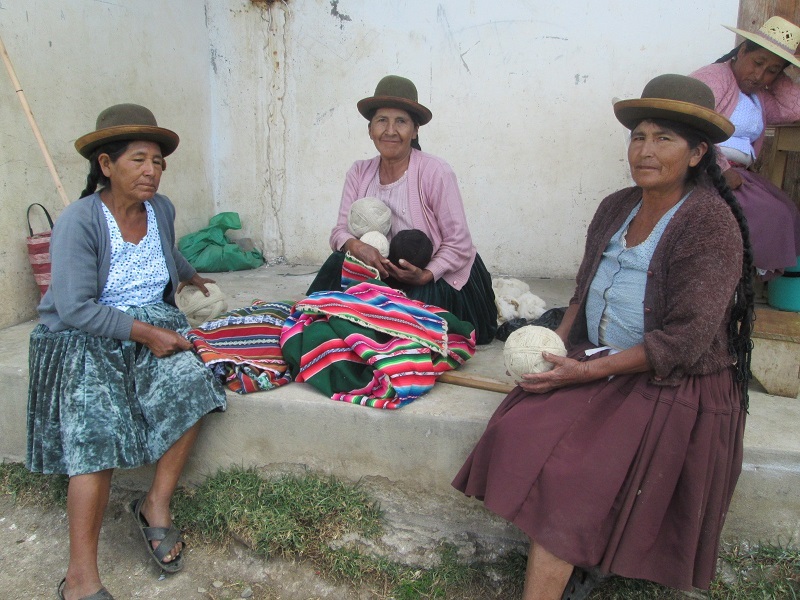 Prior to the appearance of plastic sacks, rural women wove “costales”, gunny sacks, out of llama fiber or local wool. Doña Máxima returned having had no luck in finding the burro. Fiber or plastic gunny sacks are sewn shut for transport, so women´s sombreros are usually adorned with fake flowers and a large sewing needle or two. Doña Gregoria came out of her courtyard bearing rope halters, cargo padding, and straps. 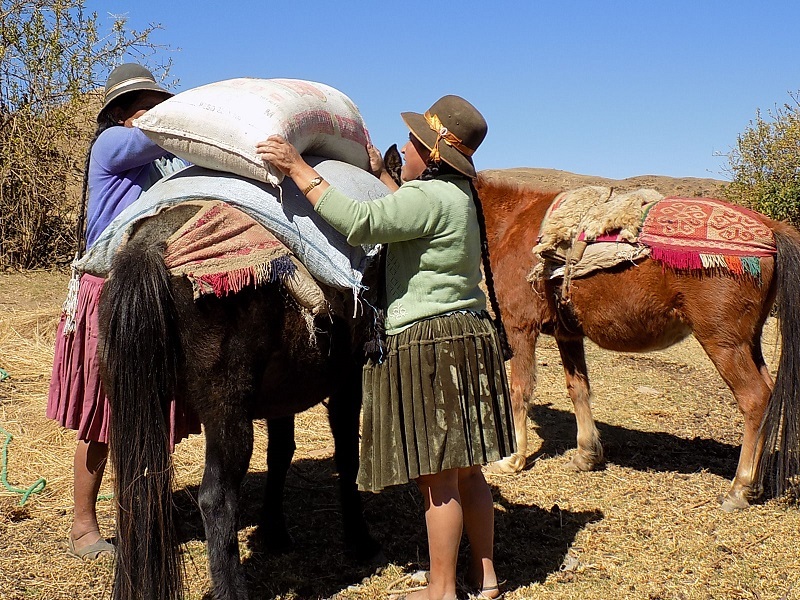 She picked out 2 nearby small horses that she and Doña Máxima quickly captured and loaded with the bags of fertilizer. Weavings are often used as part of the cargo rigging and wrap around under the tail of the horse or burro. 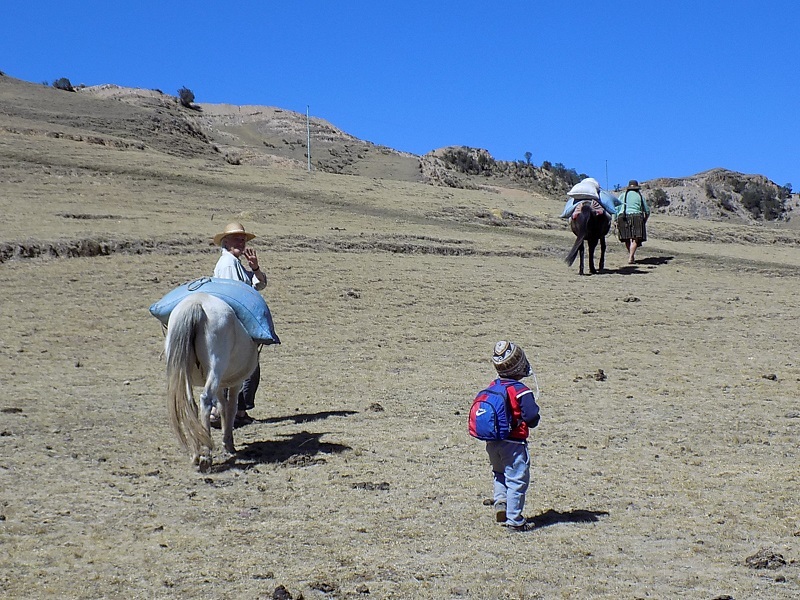 The walk back to the truck didn´t look steep, but at the higher altitude the horses´ pace of walk 10 steps then take a break was ideal. Once the bags were loaded on the truck, the horses were let loose to roll and wander off. The humans all plopped in the shade of the pickup to enjoy a campo picnic – a communal pot of rice, potato, and fried eggs. Hey Dad, This Is a Lot More Work Than a Trip to Home Depot! Team registration for Spinzilla Spinning Week took place on Sundays when the Huancarani weavers were in town for market day. Doña Beatriz who is a CdA participant when she´s not farming in her community of Sanipaya confirmed that she and 5 other spinners from Sanipaya wished to participate again. Unfortunately, there has been no response to the request for 2 volunteers for Spinzilla Spinning Week. The team slot for a foreign spinner will be held until the end of August, at which time it will be released to a local spinner. A social media volunteer is still needed in Independencia during the October 2 to 9 Spinning Week plus the 2 additional days to help with measuring the yardage.